La Chronique : "Commemoration of the 50 years of the maiden flight of the Alouette II"
Rotors du Monde society has organized a commemorative afternoon in Helidan Toussus-le-Noble airport established company's facilities in order to celebrate the 50th anniversary of the maiden flight of the Alouette II. 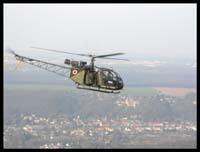 Two commemorative flights were accomplished with Helidan F-GPEP registered SE3130 Alouette II s/n 1322. 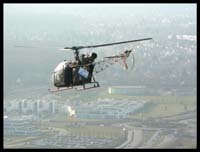 The pilot was Mr. Patrick Garreau ( Helicopter Professional Pilot & Instructor ). 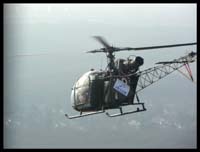 Mr. Jean Boulet, Mr. Rene Mouille and Mr. Vincent Furon ( Rotors du Monde ) took place for the first ride. 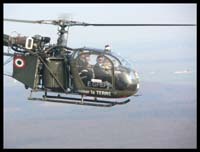 Mr. Charles Schmitt, retired Director of Heli-Union, Mr. Charles Chung, H.A.I. International VP, and Mr. Roger Barson, son of Rene Barson who was the early Alouettes flight test mechanic, were on board for the second rotation. 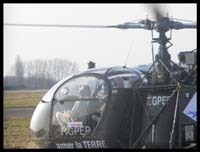 A French Air Force "Fennec" helicopter and its crew from EH 03/067 "Parisis" also attended to the ceremony. 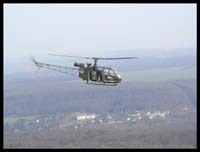 The military chopper flew in formation with the Alouette II in order to take air-to-air pictures during the first flight. Those pictures can be seen on this page thanks to Villacoublay based EH 03/067 "Parisis". Organize a meeting with all the persons who have designed, realized and tested the Alouette II in 1955 is not an easy task. However Pierre GILLARD has succeeded in gathering them to take historic photos in Marignane on June 25, 2005. On the first picture, from left to right : Rene MOUILLE, Henri PETIT, Jean BOULET and Gerard HENRY. Madame MOUILLE and Pierre GILLARD joined the group for the second picture taken by Fabrice PALUMBO. Thanks to company Aeromecanic of Marignane for its support.